Kitchens and bathrooms can now be refinished at a fraction of the cost of replacement in 2 days or less. Baton Rouge, Louisiana. 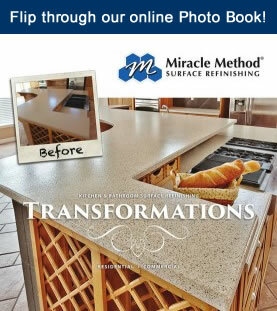 – April 2, 2019 – Miracle Method® Surface Refinishing, the largest kitchen and bathroom refinishing company in North America, has expanded into the Baton Rouge area. 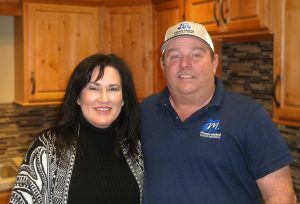 Seasoned surface refinishing veteran Eric Davis and his wife Debbie are now ready to help customers throughout Louisiana. “We were looking for a company to help me get my little refinishing business off the ground. What we found in Miracle Method was a whole new method of support to help us go from side-business to an exciting full-time venture. We are very excited to offer Miracle Method Surface Refinishing in Louisiana, an area that really needs a quality alternative to a timely and expensive renovation, “ Eric said. The newly married husband and wife team, along with several technicians, have passed extensive training at the Miracle Method Corporate Headquarters in Colorado Springs, Colorado. With 40 years of experience, Miracle Method is the fastest growing kitchen and bathroom surface refinishing company in the industry. The company has shown a 73 percent sales increase over the last six years, and specializes in ceramic tile, bathtubs and surrounds, showers, countertops,vanities, and sinks. Miracle Method® Surface Refinishing is the nation’s largest bathroom and kitchen surface refinishing franchise, with more than 150 locations throughout the U.S.. Founded in 1979, Miracle Method specializes in bathtub, ceramic tile, and countertop refinishing and strives to constantly improve their areas of expertise. The award-winning franchisor was listed on Entrepreneur Magazine’s Franchise 500® list in 2019 and is also an actively participating member of Vet Fran. Miracle Method’s franchise owners all live in the markets they serve and pride themselves on being independent, local small business owners building outstanding reputations in their communities. For more information about Miracle Method or to inquire about franchise ownership, visit www.miraclemethod.com or call 877-434-5096.